The system was approved by the Trans-Canada Highway Act of 1949. The Trans-Canada highway officially opened in 1962, and was completed in 1971. The opening on the Trans-Canada was celebrated twice, once by a provincial event July 30th, 1962 and then by the federal government on September 3rd. 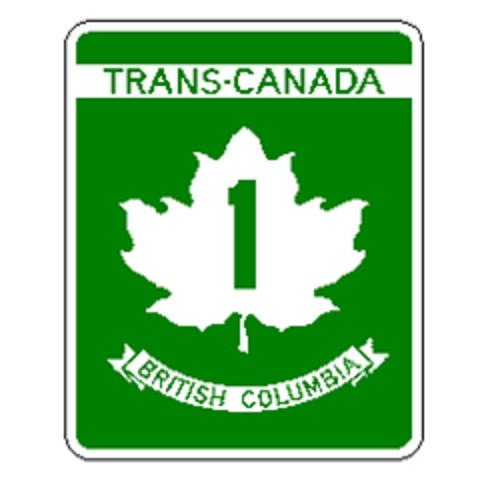 The Trans-Canada highway system is recognizable by its distinctive white-on-green maple leaf route markers. The highest spot on the Trans-Canada is the Kicking Horse Pass with an elevation of 1643 m.
The Kicking horse canyon section of the Trans-Canada Highway carries 10,000 vehicles per day during the summer. Of that, 24% is heavy traffic, which is five times the provincial average. At 10 lanes, the new Port Mann Bridge will be the widest in the world. At nearly 8,000 km, the Trans-Canada Highway is one of the longest national highways in the world (Australia’s Highway 1 beats it at over 20,000 km). The Confederation Bridge connects New Brunswick to Prince Edward Island and is the longest bridge over ice covered waters in the world. There are two places that claim to be the western terminus of the Trans-Canada Highway – Victoria and Tofino. And there you have it. Armed with those little tidbits, you too can be a titan of TCH trivia and amaze your friends on your next road trip. They also make handy ice-breakers at parties. If you’re interested in learning more about the Trans-Canada Highway, we’ve got lots more for you to check out here. Hi Derp – are there any facts specifically you are looking for which aren’t included? Is this question in regards to a specific section of the Trans Canada in BC? Is there a specific fact you have concerns about? We would love to clarify any issues. Let us know, thanks!